Crafts and Cravings: It's Challenge Time again! Hello! Here is my post for Riley and Company's new blog challenge. If you are looking for today's sneak peek for the new release this Thursday click HERE. That's right you heard correctly, there's a new release on Thursday at 10pm EST! Be sure to join us for the new release blog hop! Hostess for this challenge is Frances, and she has challenged us to make a card with "spritzing" on it. This is perfect as I have been a little spritz happy lately! I have used a rose spritz and a green spritz to make the background on this card. 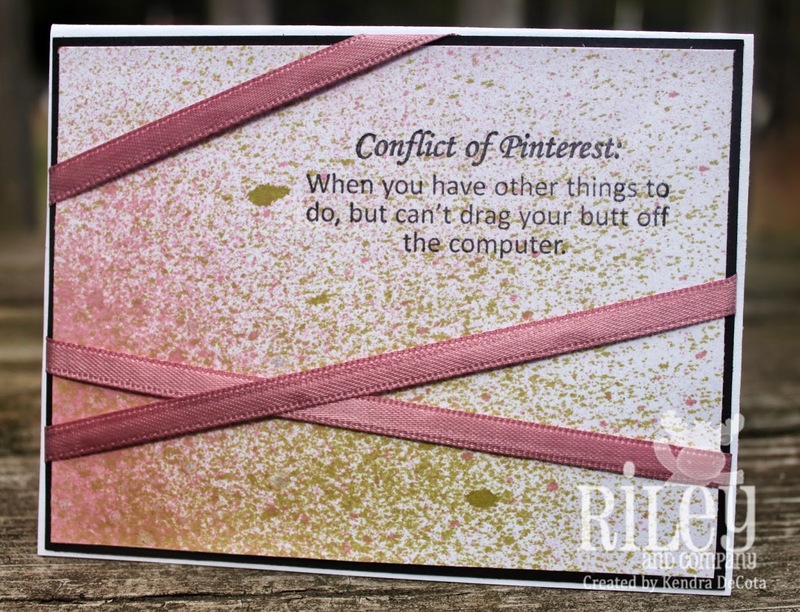 The Funnybones sentiment is Conflict of Pinterest that you can find HERE at the Riley and Company and Funnybones store. I have totally spent many an hour on Pinterest, how about you??? Please join in our challenge, and join us this Thursday, May 29th at 10pm EST for our release of 34 new Funnybones stamps! That sentiment is so true! Thank you for joining us at MMM. love the spritzing and yes, the sentiment made me laugh, how true! Love your style! Really pretty - please be sure to join us at AAA Card Challenge, too! I'd love to see what you create!